The FPU100 series has been discontinued. Please see the FPU400 Series as a possible alternative or contact our Flow Engineering Department. 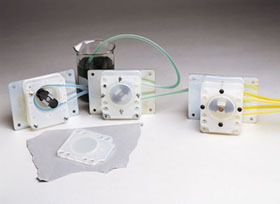 FPU100 Series peristaltic pumps offer simplicity at a reduced cost. The UL-listed AC or DC motor turns the rollers, which squeeze fluid through the precision-bore high-tolerance tubing in a wavelike motion, acting like a positive displacement pump. The fluid doesn’t touch the pump; it only comes into contact with the tubing. This makes the pump suitable for fluids carrying small particles. FPU100 pumps continuously overocclude the tubing, which makes the pump self-priming and non-siphoning. They are easy to maintain, with few moving parts and no seals or valves to clog, clean, or replace. As one section of tube fatigues, just move the tubing to a section that hasn’t been under the rollers and continue pumping. Or simply replace the supplied tubing. The replacement 230 mm (9") lengths of precision-bore tubing ensure repeatable pumping rates time after time. The pumps are supplied with tubing that has polyethylene union connectors for hooking up system tubing. The replacement 230 mm (9") lengths of tubing come without connectors. The pumps are supplied standard with a mounting panel. The AC-powered pumps are also available in a rugged polycarbonate enclosure for bench mounting. Maximum backpressure is 15 psi without derating (up to 25 psi @ 75% of maximum flow). Maximum suction head is 8.5 m (28'). Flow rate repeatability from one pump to the next or when replacing tubing is within 8% of maximum flow rate listed. Shipping weight is 1.6 kg (3.5 lb) for all sizes. These pumps are ideal for metering/dosing, repetitive dispensing, and general liquid/gas transfer, and they have a 100% duty cycle for continuous operation. The AC-powered pumps are also available in a rugged polycarbonate enclosure with on/off switch, power indicator lamp, and rubber feet for benchtop use. Each is supplied with a 1.8 m (6'), 115 Vac, 3-wire cord. To order, select the desired pump. Add suffix "-CASE" to model number and add $75 to price. For 240 Vac models with European plug, consult OMEGA’s Flow Department. An optional 24-hour timer with momentary "on" switch for priming the pump is also available for the case unit. The timer is settable up to 24 hours in increments of 15 minutes by internal DIP switches. To order case unit with timer for 115 Vac, add suffix "-CASE-CT" to model number and add $95 to price. * The FPU4500 comes with Norprene tubing. FPU4500 not available in case.